This question comes from an Assistant Strength Coach at a major Division I University. Q: I train my grip hard, but don’t ever seem to make much progress. I try to be well-rounded with my grip training and specific, but it’s hard to master. Any tips on training the grip for deadlift? 1. My top exercise for someone that asks me this question is heavy dumbbell rows – high reps using a 1 3/8″ handle. I work up to a max set of 20 then add 10 pounds and start over. My best on this is 167×20 and 177×16. Recently I did 187×10. I have really good carry over on these because as my grip starts to fail I can still hold the handle in the tips of my fingers and thumb and perform reps. I don’t get the same feel doing barbell rows – once the grip goes on BB rows the bar pops out. This has allowed me to hold some deadlifts that have started to open up my hand. 2. My next best exercise for this is to work up to a set of 5 double overhand no hook. Do this on a light week – it will give your back a bit of a break but will still make you work because as your grip fails the weight starts feeling really heavy! Once a month or less is fine for these – you want to inch that record up every time. My best here is 570×5 with no belt. 3. 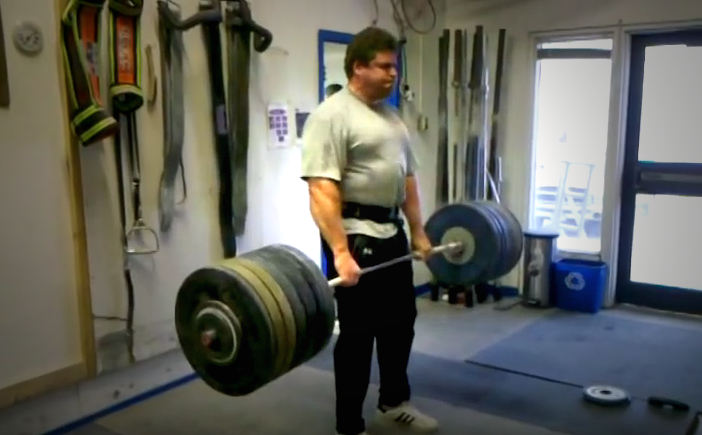 For double overhand hook grip I would suggest a one arm deadlift on a thick rotating handle like the Rolling Thunder, FBBC Crusher, Country Crush, etc.. I normally train this for singles but have had recent success on this lift with one set of 10 once a week – always pushing for a small max increase (1-2lbs). For over/under mixed grip I would suggest plate pinching to build your thumb strength for clamping down on the index finger. I always do pinch grip for heavy singles with some occasional endurance things like passing around back or hand to hand until you fail. 4. Finally for either type grip – hook or mixed – I would suggest torsion spring grippers. Stick to low reps or singles on these either during the pulling part of your workout or right away after. You wont have much consistency if you do them after taxing your grip on other supporting grip or pinch grip exercises mentioned above. If you have the time you could also do these on off days or days that you aren’t pulling. I have had real good results training grippers every day as long as you keep the reps low. I am currently using a program that has me doing grippers twice a day – light in the morning and heavy at the gym while lifting. Grippers are great for hand health and general grip strength – it is one of the only grip exercises you can do that is dynamic – most everything else is static – so it helps balance you hand strength and build mind-muscle connection with your hand that carries over to all sports. Hope this helps! This entry was posted in Classics. Bookmark the permalink. Owner and founder of Gillingham High Performance.